Word of Mouth Marketing: An unpaid form of promotion in which satisfied customers tell other people how much they like a business, product, or service. 4 HUGE REASONS WHY LOCAL BUSINESSES NEED A WEBSITE! When new competitors come into your market, in many cases, they have to market hard to compete with existing businesses. Meaning WEB DESIGN, SEO, PPC, SOCIAL MEDIA, etc… is already done before they move in. THEIR PLAN IS TO TAKE AS MANY CUSTOMERS AS THEY CAN FROM YOU! So when your word of mouth customers search for you online, will you be there? If not, then your competitor just made a new client. Marketingcopilot.com said it best…”For many customers, your website will be their first introduction to you. It’s your first chance to make an impression, the first point of entry for capturing their interest, and the first opportunity to make a sale. It’s also your strongest salesperson”. Your website is like having a 24/7/365 sales team pushing your product or service! 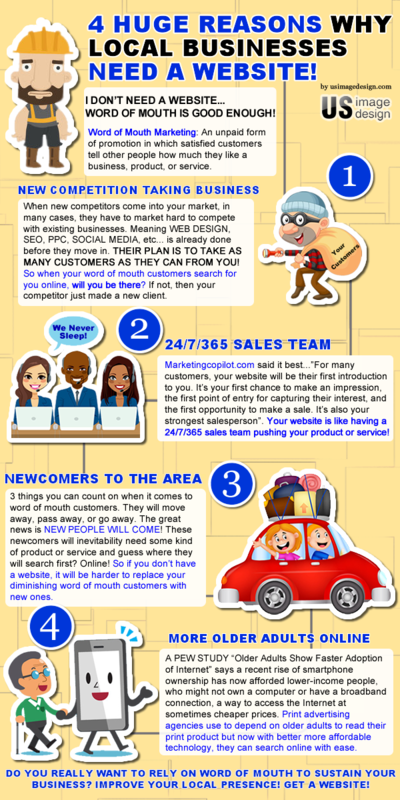 3 things you can count on when it comes to word of mouth customers. They will move away, pass away, or go away. The great news is NEW PEOPLE WILL COME! These newcomers will inevitability need some kind of product or service and guess where they will search first? Online! So if you don’t have a website, it will be harder to replace your diminishing word of mouth customers with new ones. A PEW STUDY (source) “Older Adults Show Faster Adoption of Internet” says a recent rise of smartphone ownership has now afforded lower-income people, who might not own a computer or have a broadband connection, a way to access the Internet at sometimes cheaper prices. Print advertising agencies use to depend on older adults to read their print product but now with better more affordable technology, they can search online with ease. Owner of US Image Design. Has been helping clients with internet marketing, web design and SEO since 2006.